There are certain predicates within the KFPS that Friesian horses can achieve. These predicates are based on grading scores/premiums, sport aptitude, sport performances, offspring grading scores/performance or a combination of the afore mentioned. The Ster predicate may be awarded to horses from the year they are 3 years old. To be considered for the Ster predicate horses need to have gained a 1st or 2nd Premium with no mark under 5 when graded age 3 years or older. The horse must meet minimum requirements for exterior, movement (in hand), and height at the withers minimum height 1.56m (mares), 1.58m (stallions & geldings). The Ster predicate may be awarded to mares in the Studbook register, geldings in the Gelding Book, and Foalbook stallions. The awarding of Ster for mares and geldings can take place at the same time as Studbook entry. Foalbook stallions that gain their Ster predicate remain in the Foalbook (vb) and are NOT approved for breeding. If they are later gelded, they keep their Ster status. As from September 2017, in addition to lineage verification, all mares that are declared Ster and all mares with a foal accepted for registration also need to undergo DNA testing for hydrocephaly, dwarfism and the chestnut factor. The Crown predicate may be awarded to mares 3 years and older of exceptional quality. In Holland, the mare must achieve a first premium at both a Breeders’ Day and a central inspection within the same year. In the UK, she must first achieve a first premium at the annual inspections, be at least 3 years old and have a height at the withers of at least 158cm to be considered for provisional Crown status. For definite Crown status, the provisional Crown status mare must complete an AFBP or IBOP test before the end of the proceeding calendar year. The AFBP test is intended to establish the horse’s aptitude as a dressage and/or harness and/or show driving horse, primarily aimed at horses from 3 through to 5 years. It also assesses willingness to work and stable manners over a period of 33 days, or for an abbreviated version of the test, of 15 days. The IBOP test is a performance test intended to establish the suitability of a horse for a certain use be that dressage, harness or show driving, for horses aged 4 years or older. The mare must receive a minimum score of 77 points and an average of 7.0 for the walk and trot, or to have acquired the Sport title in the same period of time. To complete the AFBP test a mare would currently have to return to Holland. At present only the IBOP test is offered at the UK inspections. The Model predicate may be awarded to mares 7 years and older of really exceptional quality, being of an even higher standard than Crown. In Holland, the mare must achieve a first premium at both a Breeders’ Day and a central inspection within the same year. In the UK, she must first achieve a first premium at the annual inspections, have a height at the withers of at least 160cm and must have suckled or be suckling a foal to be considered for provisional Model status. 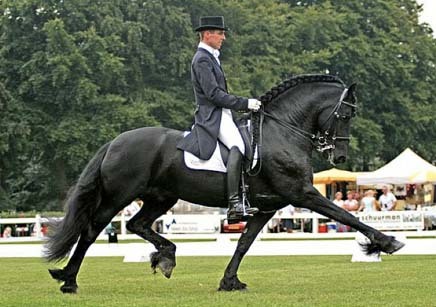 For definite Model status, the provisional Model mare must complete an AFBP or IBOP test, before the end of the proceeding calendar year, with a minimum score of 77 points and an The AFBP test is intended to establish the horse’s aptitude as a dressage and/or harness and/or show driving horse, primarily aimed at horses from 3 through to 5 years. It also assesses willingness to work and stable manners over a period of 33 days, or for an abbreviated version of the test, of 15 days. The IBOP test is a performance test intended to establish the suitability of a horse for a certain use be that dressage, harness or show driving, for horses aged 4 years or older. The mare must receive a minimum score of 77 points and an average of 7.0 for the walk and trot, or to have acquired the Sport title in the same period of time. To complete the AFBP test a mare would currently have to return to Holland. At present only the IBOP test is offered at the UK inspections. Show Driving (cat. I &II honorary class and cat.III open class, in a single season placed 6 times as prize winner in the “green season” (15th April – 1 October). Combined Driving (Class 3 + 10 points - but it must be agreed with KFPS and KNHS in advance which horse is being entered for Sports Predicate). For horses competing in sports in the UK and anywhere outside of the Netherlands, comparable requirements will be applicable and will be evaluated by the KFPS Sports Committee / Inspection Jury. Preferent status may be awarded to Foalbook, Ster, Crown and Model mares if they have produced four high quality offspring, defined as Ster, Crown or Model mares, Ster geldings, Ster Foalbook stallions, Approved Studbook stallions, and/or stallions through to the second round of the Central Stallion Judging. Preferent status may also be given posthumously and can be requested by either the mare owner or the owner of the offspring. In order to gain Preferent status, the character and work-willingness of the stallion and his offspring, the percentage of offspring with white markings, and the overall contribution to breed standards will be taken into account, particularly for stallions with between 700 and 1000 points, whose owners apply for the Preferent title. This predicate is given to mares who have produced three offspring that have been awarded the Sports predicate.